The GDS Academy was previously known as the Digital Academy, which started at the Department for Work and Pensions (DWP) in 2014. We built the project from the ground up to help people working in digital understand how government was working in new ways to build services for its users. There was a real appetite for training and we grew rapidly. We developed a catalogue of courses to help our colleagues thrive in the world of agile and user-centred design. Other departments and local authorities got in touch. Our alumni became a thriving community, working across departments and boundaries, continually improving their skills and putting user needs at the heart of everything that they did. We trained 5,000 civil servants in 3 years. In late 2016, the minister announced that our Academy should expand to support the development of digital skills and awareness across the Civil Service. As a result, the Academy transferred to Government Digital Service (GDS) on 1 May 2017. This is a really exciting time for us. We’re now an integral part of the Digital, Data and Technology Profession, which represents around 17,000 professionals across government. We’re expanding nationwide, further increasing GDS’s national presence, we’re reviewing our curriculum, and we aim to train more than 3,000 people per year. 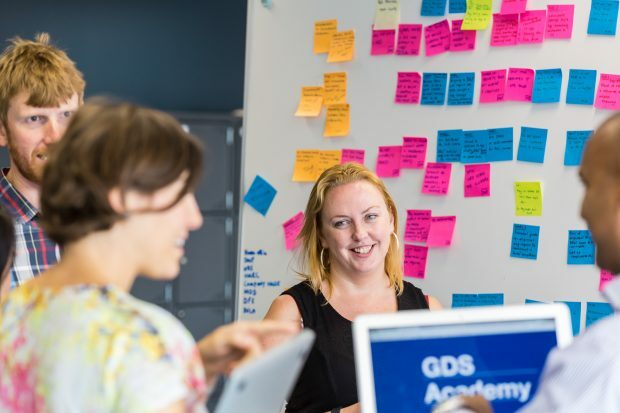 Whether you’re a specialist or non-specialist civil servant, the GDS Academy will help improve your digital awareness by giving you a better understanding of the user-centred methodologies which are at the heart of government transformation. We now offer 10 courses focused on digital and agile delivery, a subset of practitioner courses, a 10-day foundation, and a course in agile for more senior leaders. You can train at our centres in Leeds, Stockport, London and Newcastle. If you’re in Scotland, you can train at our Scottish Government ‘pop-up’ in Edinburgh in September. We also run pop-up academies for departments in different locations. The remit of the GDS Academy is quite different to that of the Digital Academy. Obviously we can’t do this alone so we’ve embarked on a discovery phase to involve specialist communities, government departments, agencies, academia and expert providers. We want to make sure user needs are met and we want to prioritise the skills we need to develop within the Civil Service as we shape the future curriculum. I’m proud of all that we’ve achieved and can’t wait to see the GDS Academy break new grounds to support government in building the skills it needs to deliver its ambitious transformation. For now, we’ll keep you updated via Twitter and our GOV.UK page, where you can also book our courses. You can also follow the head of the GDS Academy, Annette Sweeney @DigiSweeney.